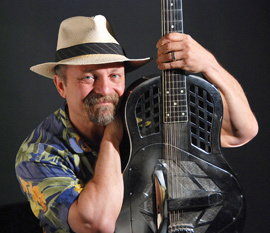 Roots music fingerstyle guitar virtuoso Toby Walker, who blends blues, ragtime, country, bluegrass, rock and old time jazz into his own unique style, has toured the US, England, Wales, France, Germany, Belgium and Holland. He has been featured in the New York Times, the London Sunday Times, the London BBC, Sirius-XM radio and was the 1st place recipient of the International Blues Challenge Award - Solo division - given out by the Blues Foundation in Memphis TN. Jorma Kaukonen of Hot Tuna and the Jefferson Airplane says "Flat out... you have to hear this great musician... I'm blown away" and has employed Walker to teach at his famous Fur Peace Ranch Guitar Camp for 6 years. In 2010 Walker won the NY Music Award for 'Best Instrumental CD,' sharing the honors with Mariah Carey, Rufus Wainwright and Judy Collins among many others. Walker has recently released three instructional guitar DVD's for the world famous company Homespun Tapes which have been getting rave reviews. And Carnegie Hall acknowledged his rare talents and hired him to augment and teach in their "American Roots" program aimed at honor level middle school students.